When one of the giant Swamp Stalkers reaches maturity and has been suitably conditioned for combat, the Elders will select a celebrated Goblin Champion to become a Sentinel. The Sentinels ride the giant Swamp Stalkers and scout the outer perimeter of the tribe’s domain. They operate independently, spending long periods of time away from the main population of the tribe. The Swamp Stalkers are creatures of the jungle and are able to move easily through almost any type of jungle terrain. 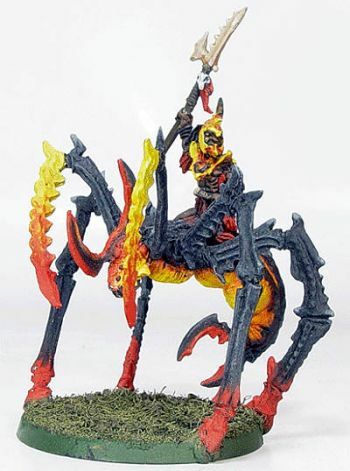 The Sentinels form a strong bond with their arachnid mounts, communicating basic commands to them with odd clicking sounds that the Swamp Stalkers respond to. The Sentinels enjoy a high status within the tribe and often act as war leaders to the swarm.